New Rochelle, NY, December 10, 2018–A team of researchers developed a novel model of partial bladder outlet obstruction (pBOO) in female swine and used this model to show that even after inducing severe urinary outlet resistance and damage to the bladder, they could achieve significant improvements in bladder capacity through bladder reconstruction using acellular bi-layer silk fibroin (BLSF) grafts. The BLSF matrices supported the growth of new tissue with contractile properties, as described in a study published in Tissue Engineering, Part A, peer-reviewed journal from Mary Ann Liebert, Inc., publishers. 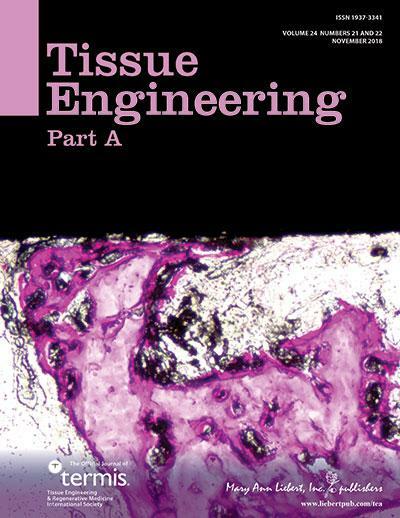 Click here to read the article free on the Tissue Engineering website until January 10, 2019. The article entitled “Augmentation Cystoplasty of Diseased Porcine Bladders with Bi-layer Silk Fibroin Grafts” was coauthored by Joshua Mauney, PhD, Boston Children’s Hospital and Harvard Medical School, Boston, MA, and a team of researchers from those institutions and Veterans Affairs Boston Healthcare System, West Roxbury, MA, Brigham and Women’s Hospital, Boston, and The University of Massachusetts, Boston. The severe pBOO swine had a 61% decline in bladder compliance compared to the start of the study. By 3 months after the tissue engineering/reconstruction, bladder capacity and compliance had increased significantly (79+19% and 171+75%), compared to baseline values, respectively. The BLSF scaffolds were made from aqueous silk fibroin solutions derived from Bombyx mori silkworm cocoons. Research reported in this publication was supported by the National Institutes of Health under Award Numbers 5R21EB020860 and P41 EB002520. The content is solely the responsibility of the authors and does not necessarily represent the official views of the National Institutes of Health.